Raise The Dead will be available as DVD + CD Digipack . 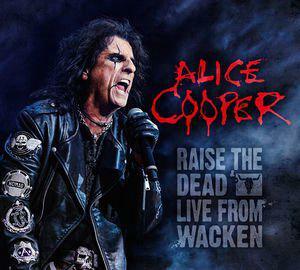 The DVD contains 22 songs from the Wacken concert and bonus material shows an interview with the man himself.ALICE COOPER is a living legend and master of rock. Way back in his early days his style was labelled "shock rock", nowadays we would call it the greatest rocknroll entertainment with a grandmaster in perfect shape on vocals. His W:O:A® gig from 2013 therefore can be seen as one of the summits of the festival history and this DVD / double CD package "Raise the dead / Masters of madness" clarifies how great the leading figure in horror theater on a rock stage still performs. First of all you witness a representative cross section through the 45 plus years career as singer of the band ALICE COOPER and later on as this figures embodyment. Glamrock, hardrock and progressive elements, there is everything included a real fan demands. His backing band plays all of this old and younger stuff in a tight fashion as if they did it all the way since 1969 already while Alice sings as great as ever if not even better. The second part of the show features a couple of tributes to his fallen heroes like John Lennon and George Harrison with "Revolution", Jim Morrison and Ray Manzarek with "Break on through", Jimi Hendrix, Noel Redding and Mitch Mitchel with "Foxy lady" plus Keith Moon and John Entwhistle with "My generation", all played the ALICE way. The grand final features two of his greatest hits afterwards, "Poison" and "Schools out" next to a coverversion of "Another brick in the wall". There are 24 tracks on the double CD and 22 on the DVD plus a backstage interview with Alice. A must have for all classic rock aficionados.